That Pinocchio was a significant commercial failure is something I can sort of get my head around, but it ultimately seems pretty hard to believe that something so beautiful and heartfelt could be so soundly ignored. I have no such difficulty believe the same thing of the other Disney feature released in 1940, of unquestionably greater personal importance to Walt Disney himself. I'm referring of course to Fantasia, the baldest expression of Walt's desire that animation be taken as seriously as any other art form, and the most technologically accomplished film he ever oversaw, with its cutting-edge stereo sound system, Fantasound; a system so advanced, in fact, that only a baker's dozen theaters ever installed it, for the film's spectacularly money-losing roadshow run in 1940 and '41. Setting aside the unimaginable amount of money that the film cost; only a madman would think that you could sell people a two-hour animated anthology film consisting of what amounts to early music videos set to eight pieces of classical music. But let us never forget that however much money we like to think of the Disney Company generating, Walt Disney was a godawful businessman. He made the movies that he wanted to see, and in this case he wanted to see a movie that is, when all is said and done, a demo reel for some of the most inventive animation in the history of the medium. The film is meant to suggest that we are attending a concert and so in its original version (as well as the DVD release), it begins with a simple curtain rising, as we watch the members of an orchestra take their places for the impending concert. After a moment or two of this, New York music critic Deems Taylor steps up and briefly explains the concept behind this Fantasia experiment. He will return in between segments throughout the film, and I think the importance of these interstitial moments to the overall success of the whole is typically under-appreciated. Taylor is a bit hectoring at times, but in the main he is a very straightforward man who isn't trying to scare us, but simply wants to make sure we have enough information to go into each new piece. He makes Fantasia an exceedingly friendly peek into the world of classical music, a realm that most 20th and 21st Century Americans would rather avoid at all costs (though I believe that classical music was not vilified as snobby, elitist, and boring in 1940 to quite the same degree that it has been in the intervening years). What could easily have been a lesson instead becomes an exploration, with a particularly well-spoken guide to bring us along. Then the great conductor Leopold Stokowski ascends the podium in the center of the orchestra, and one of the most singular events in movie history begins. The first segment of the film, set to Johann Sebastian Bach's "Toccata and Fugue in D Minor", is by far the boldest, and very nearly the most famous in the whole movie. The Disney Studios' first leap into abstract animation, it is an attempt to express in visual terms the experience of listening to music, being aware of the presence of instruments and the people playing them; and thus, though it is a rather daunting thing to look at for someone expecting a cartoon with pretty music, it is the ideal start to a film like Fantasia. I am about to voice a heresy: I think this sequence is overrated. Very lovely in many ways, but overrated. Basically, abstraction is not something that came terribly easy to the Disney animators, and they over-thought it a little bit here (In the future, when they were working with a sort of pseudo-abstraction, a highly stylised interpretation of concrete events - there's a brilliant moment of this sort in Bambi - they would have much greater success. Of course, I cannot demonstrate that "they" refers to the same individuals, but that is the damnable thing about discussing institutional evolution). The tactile quality of the animation itself is extremely appealing, mind - I certainly don't want to suggest that the sequence isn't lovely to look at. But there's a wobbliness to it at certain moments: the attempts to animate parts of instruments flying around in the air is just silly, if you ask me. The best part of the sequence is the opening, live-action footage with stark colored lights (shot by James Wong Howe, if the IMDb is to be trusted), putting all our attention on the instruments themselves; it is not abstract as such, but it is dramatic and beautiful. The next segment, and my personal favorite, is set to a re-ordered version of Pyotr Ilyich Tchaikovsky's Nutcracker Suite - a far less trite choice in 1940, when the ballet had not yet received its first full U.S. performance. It is a perfect example of what Fantasia does best: following the spirit of a piece while bending its specifics out of recognition. In this case, we have ballet music; and the sequence is undoubtedly balletic, with one dance after another for several minutes. But in the hands of the animators, it becomes a tribute to nature and the gentle change of seasons, with the fairies of the ballet turned into sprites responsible for making flowers blooms, leaves turn color, and frost to form its intricate designs. Meanwhile, the foreign emissaries who present their dances are now plants and animals. I don't suppose many people would argue if I said that this is the loveliest sequence in the movie. It also might use the widest variety of animation techniques to achieve its look out of anything in the film ("Toccata and Fugue" would be the other candidate). This is the painterly sequence of Fantasia, the one where the contrast of textures is the most important; particularly in the finale, "Waltz of the Flowers", in which the straightforward cel-animated fairies are set against the drybrushed backgrounds, and whatever technique they used to make the ice and the snowflakes, I have never known. Here is also the film's showiest demonstration of the technical competence of Disney animation, particularly in the Arabian dance, with gossamer fish swimming about with a fluidity and grace rarely matched before or since. And the sequence also boasts my personal favorite minute and change in the whole of animation history, the Chinese dance of the mushrooms, and I just don't give a damn if its racist (which it totally is): an absolutely perfect bit of pantomime, demonstrating exquisitely how well the animators could create personality from silence and movement. The third sequence is the most important and most famous: Mickey Mouse in Paul Dukas's The Sorcerer's Apprentice. I say most important, because without this short, there'd have been no Fantasia at all. The story goes that Walt Disney was concerned that Mickey had been upstaged by characters like Donald Duck, Goofy, and even Pluto, and he wanted to give his star character a last moment to shine. It was to be a simple, elegant piece, a silent film save for Dukas's narratively charged music, a reminder of all that Mickey could be at his greatest. And thanks to Walt's inveterate perfectionism, it got expensive fast. Roy Disney, the financial brain that always had to rein in his little brother's artistic ambition, quickly realised that "The Sorcerer's Apprentice" could never make money as a stand-alone film. It had to be coupled with a feature. Naturally enough, the feature ended up costing proportionally as expensive as the short did, and all that Roy's good sense achieved was to piss away virtually all of the money left over from Snow White and the Seven Dwarfs. At any rate, that horribly costly Mickey short is a pretty miraculous little thing - almost without question the finest Micky cartoon ever made, not only because of its ambition but because of the incredible degree of care that went into every single drawing. The use of lighting and color in this sequence is hardly subtle, but it is effective nonetheless, and more importantly, it's the first time that a Disney project used lighting and color in an entirely expressionist, non-representational manner. The animation itself is up to the very high standards the studio had set for itself in that period; the water effects in particular very nearly rival Pinocchio. Most importantly, "The Sorcerer's Apprentice" is wildly charming and entertaining. Mickey wasn't one of the biggest movie stars of the 1930s for no reason, and here he was made a roguish scamp again for the first time in a long while. The humorless sorcerer - modeled after Walt Disney himself - is a great character despite his limited screentime, the army of brooms is both formidable and magical, and the narrative itself is scary and funny in equal measure, and at the same moment. Following a very cute "meeting" between Stokowski and Mickey, Fantasia gets aggressive, with Igor Stravinsky's Rite of Spring, a work that had debuted to riots and violent hostility a mere 27 years earlier (the original roadshow version of the film gets a tiny joke in about that very controversy: when Taylor announces the title of the piece, there is a hideous crash as the chimes player knocks over his instrument). Stravinsky was the only composer living to see his work given the Fantasia treatment, and while he was vocally critical of the significant re-ordering and cutting of his composition, he allegedly conceded that the animators got to the heart of what he "meant", even if they had to absolutely jettison his original concept (this factoid is, at the very least, highly debated). The Rite of Spring was a ballet about primitivism; and the Disney team took that notion all the way back, making a 25 minute epic about the creation of the world, the first flowering of single-celled life, and so on up to the dinosaurs. The sequence is bold, with simple lines and strong colors to match the exceedingly challenging dissonance and clamor of the ballet. Early on, in the cosmological sequences, it has a very impressionistic feeling that becomes more and more violent as the action moves further along into Earth's history. It's perhaps fair to credit this stretch of the film as the most perfect combination of animation and music of them all: the music's stated goals are well met by the intensity of the visuals. There are, that I can name, two flaws only: the first is that it drags on a bit in the beginning. The second is that, frankly, Stravinsky is easy to dislike; I don't even know that I much care for The Rite of Spring myself. And if you conclude that the music is just too clamorous for your tastes, there's a lot of it to get through. After an intermission, there's a strange little vignette with Taylor interviewing the film's soundtrack - a game attempt to show how motion picture sound looks on film, that doesn't really go much of anyplace. But somehow, it fits into the whole Fantasia fabric such that I couldn't imagine removing it, although I always get fidgety before it ends. The next sequence is set to what I imagine is the most prominent piece of music in the film: Ludwig van Beethoven's Symphony No. 6, the Pastorale. It's also the sequence that has been subjected to the most criticism over the years. I will not address the well-known racial stereotypes that the Walt Disney Company has gone to such lengths to hide; a movie made in 1940 by white filmmakers is likely to have racist overtones here and there, and to get a flustered and panicky about such thing is an insult to film history. But the plot, which takes Beethoven's vague sketch of a ride in the country interrupted by a thunderstorm, and places it in mythological Greece, is certainly damn peculiar. And for the interminable stretch where it's nothing but cupids trying to get centaurs to hook up, it's also damn boring. So the criticism has a very valid point, and it doesn't help matters that the animation here is at its most cartoonish, with certain moments of jerkiness and awkward design that are quite enough to send the sequence howling into the lowest rank among the film's passages, even without narrative hiccups. What saves the "Pastoral Symphony" is, simply, color. Throughout the whole of Fantasia, Walt gave a relatively free hand to the animators to do anything they wanted at all - the only time he'd take such a generous approach to producing. That translated in this sequence to the most elaborate and imaginative color landscape found in any Disney project up to that point. I once attended a lecture given by the late Ward Kimball, one of the famous Nine Old Men of Disney animation, and a supervising animator on this sequence, and he recalled how it became sort of a game to see who could come up with the most playful and unusual use of color. He spoke of a particular background artist who had toast with boysenberry jam in his lunch box, and found that the particular reddish-blue of boysenberry was precisely what he'd been looking for; and there is a tree in this sequence the exact color of that jam. This sort of thing is found throughout the "Pastoral Symphony", which isn't an experiment in using color to further plot; it's an indulgence in color for its own sake, and I wouldn't give it up for the world. But I'll concede it was ill-chosen to follow the Beethoven with Amilcare Ponchielli's "Dance of the Hours" ballet from the opera La Gioconda, which like "Pastoral Symphony" is a highly cartoony passage, but is infinitely better at it. The narrative of the ballet is followed quite closely: dancers representing the morning are followed by dancers representing the afternoon, then dancers of the evening, and finally dancers of the night. The big difference is that all of the dancers are African megafauna: ostriches, hippos, elephants, crocodiles. There isn't much to say about this bit, other than that it's exactly the right time in the program to have something pointlessly, exquisitely silly. Directed by T. Hee, a veteran caricaturist, and Norm Ferguson, a Pluto specialist, "Dance of the Hours" is a palate cleanser, and a demonstration that even pretentious music snobs don't have to take themselves seriously, and it's about as perfectly-timed as any comic animation sequence from that era. Fantasia ends with a double shot: Modest Mussorgsky's Night on Bald Mountain and Franz Schubert's Ave Maria. Deems Taylor nicely, if unnecessarily, points out that the two pieces are tonally and thematically opposed, but he fails to mention how very different they are visually. "Night on Bald Mountain" is, simply put, one of the most striking, powerful sequences in Disney's history. A plotless snapshot of a dark god from Slavic mythology holding court among witches, ghosts and demons, it is by far the grimmest thing the studio made until The Black Cauldron in 1985, arguably. There is much to love about it, from the distortion effect that makes Chernabog's shadow look like black fire, to the blend of styles from painting to cels to what looks for all the world like unretouched pencil sketches, but the piece hinges on the devil god himself, animated by Vladimir "Bill" Tytla, my pick for the most gifted animator Disney had during their golden age: he was also responsible for Grumpy in Snow White, Stromboli in Pinocchio, and the sorcerer of "The Sorcerer's Apprentice". But none of those characters hold a candle to Chernabog, perhaps the most thrillingly animated character in Disney history. A great black bulk, so massive he ceases to feel like a cartoon, Chernabog's movements are the result of study of Bela Lugosi and animator Wilfred Jackson, and a fine demonstration he is of the good to which the studio put the test footage of human models; but the heft of him, his catlike movements, and his rough, graceful fluidity, that's all in the animator's craft, pen and paper and raw skill. The "Ave Maria" sequence is a strident counterpoint to the mass and intensity and thickness of Night on Bald Mountain; it is a rigorously stylised, simple piece, executed with an idiotic level of difficulty in the most elaborate multiplane set-up in Disney's history - the only really show-offy multiplane shots in Fantasia, in fact. Here's the fascination thing about this sequence: where the mulitplane camera was customarily used to suggest depth, in "Ave Maria" it instead suggests flatness: as the camera tracks along the length of an endless stretch of forest, the competing planes seem ever flatter, emphasising the lateral-ness of the shot, the degree to which it's not unlike a banner in an illuminated manuscript. Everything about the content of the images reinforce that: especially the people, indistinct, two-dimensional shapes with little circles of light coming out of the darkness. It is, all in all, a very bold-looking sequence, and coupled with the tremendously spiritual music, it becomes a sort of meditation on nature and peace, that breaks into transcendence in the last seconds, when the mulitplane camera finally embraces its true calling to give endless depth to a shot of the sun behind trees. It cannot be argued other than that this is the most ambitious film of Walt Disney's career; better to ask where it ranks among the most ambitious, or at least the most crazily optimistic, films in history. And naturally for a film of such scope, it took history a long time to catch up to it. 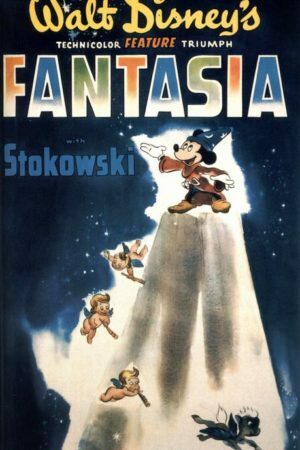 In the meantime Fantasia's epic failure left the Disney Studios on the brink of catastrophe. For my part, I think it should have been worth twice the cost: it is ribboned with flaws both impossibly minor and embarrassingly large, but it surely must count as one of the most visually stunning American movies ever made, a veritable catalogue of what makes traditional animation so inconceivably beautiful when it's being done absolutely right.